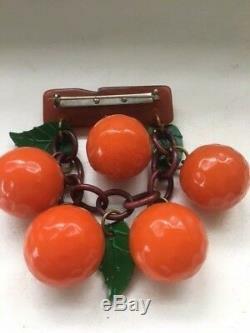 Vintage Bakelite 5 orange pin with 3 green leaves. They hang on a 2" bark looking pin base, oranges are about 3" round & carved, the leaves are dark green approx. The pin is all original. 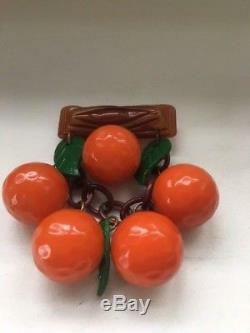 The item "VINTAGE BAKELITE ORANGE FRUIT PIN" is in sale since Wednesday, January 23, 2019. This item is in the category "Jewelry & Watches\Vintage & Antique Jewelry\Costume\Bakelite, Vintage Plastics\Pins, Brooches". The seller is "jewelfever2015" and is located in Roma. This item can be shipped worldwide.